Our Safety Partners Program is like our Outsourcing Program, tailored for situations that require a little less, or more support. It aims to direct your compliance on site or remotely through virtual solutions (if desired), and it comes backed with practical and commercially focused safety advice throughout the year. Who is your safety expert? Who ensures your workplace is legally compliant? Do you need support to ensure your workplace is safe and WHS compliant? End of year audit and report. 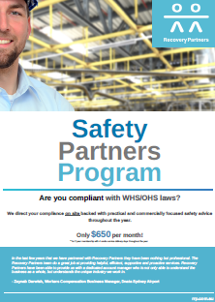 If you are a small, medium or large business who requires safety specific support and advice without fully outsourced management of WHS and Injury Management functions our Safety Partners Program is for you. Improvements to your due diligence and support for managers, leaders and workers with legal responsibilities - so they can all go home safe. Discounts on other Recovery Partner products and services.